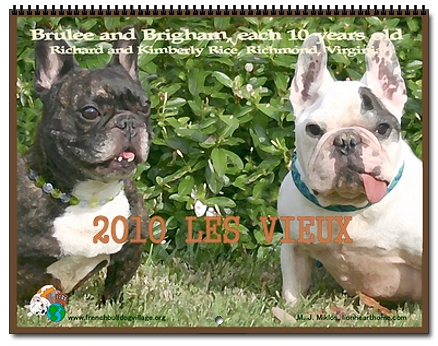 Fresh off the presses, the 2010 version of The FBVillage “Les Vieux” (old dogs) wall calendar is now available for purchase. 100% of ALL proceeds benefit the French Bulldog Village, and the fantastic work they do in placing French Bulldogs into their new homes. 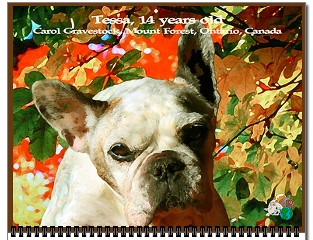 Les Vieux celebrates our senior French Bulldogs – those dogs aged ten years or older. With dogs ranging in age from 10 to sixteen years, every single page has something to celebrate. Of course, there are also some familiar faces on this calendar – check out January’s pin up gal, the ever lovely Dread Pirate Lola, looking smashing as usual. September’s cover girl also looks slightly familiar – could that possibly be Tessa, set against a back drop of colorful fall leaves? Remember, the French Bulldog Village works tirelessly to help special needs French Bulldogs and French Bulldog mixes, as well as assisting to get breeder retiree French Bulldogs into loving, adoptive homes. 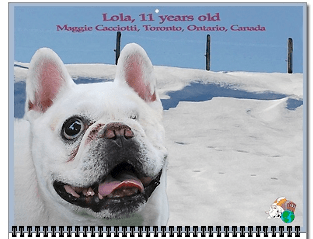 They could use your financial support, and your wall could use one of these lovely calendars!